Umberto Eco. Eco, Umberto, photograph. © Jerry Bauer. Reproduced by permission. The long list of Umberto Eco’s books and publications contains only a handful of novels, with the first two, The Name of the Rose (1980) and Foucault’s Pendulum (1989), being his best known. Despite Eco’s relatively scarce output, these novels’ remarkable international success has made him the most famous Italian novelist writing today. Before the appearance of his first novel, Eco, a man of encyclopedic learning, was already well known for his contributions to the discipline of semiotics, or the study of how meaning is communicated, as a prolific author of books and essays on a wide range of scholarly subjects, and as a gifted writer on politics and popular culture. His novels and other writings have been translated into many languages, and he has lectured and taught at universities all over the world. Background in Aesthetics, Semiotics, and Architecture. 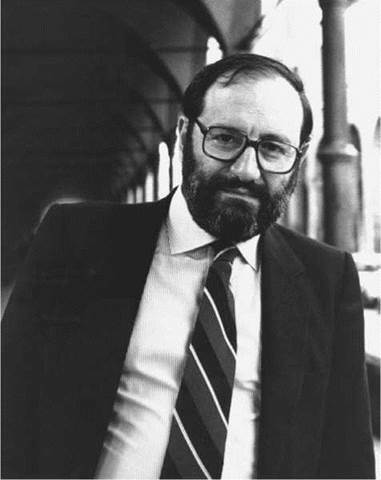 Umberto Eco was born at Alessandria, in Piemonte, Italy, on January 5, 1932. During World War II, he and his mother retreated to the mountainside area of Piedmontese. Originally an accountant at a firm that manufactured bathtubs, Eco’s father served in three wars for the Italian army. Eco’s early education was Salesian, a school of thought based on a Roman Catholic religious order established in the nineteenth century. Ultimately, Eco renounced Catholicism later in life after experiencing ambivalence about his faith. The first in his family to attend a university, Eco studied at the University of Turin, graduating in 1954 with a degree in philosophy. At Turin he came under the lasting influence of the philosopher Luigi Pareyson, under whose guidance he wrote his thesis, which became his first published book, The Aesthetics of Thomas Aquinas (1956). In 1961, Eco received his Libera Docenza (a degree that is roughly equivalent to a doctor of philosophy) in aesthetics, and from that year until 1964 he held the position of lecturer in aesthetics at both the University of Turin and the Politecnico in Milan. He was appointed professor of visual communication at the University of Florence in 1966, and in 1969 he returned to the Politecnico as a professor of semiotics. Although one might be tempted to associate Eco with the conventional notion of ‘‘arts and letters,’’ during his years at Florence and the Politecnico he was in fact a member of the faculty of architecture. The Absent Structure: Introduction to the Study of Semiotics (1968) contains an extended treatment of architecture as a medium of communication, a subject to which he has returned throughout his career. Success as a Novelist: Fame and Fortune. While pursuing his highly successful university career, Eco was not confined by his academic roles. By the end of the 1970s Eco was well known as a critic, a journalist, and a politically involved intellectual. No one, however, could have predicted the great leap in his fame—and fortune— that would follow the appearance of The Name of the Rose in 1980. Set in a northern Italian monastery of the fourteenth century, the novel is replete with literary, philosophical, theological, and historical arcana, and is punctuated by many passages in Latin and other languages. The book sold more than 1 million copies in Italy, where it won several prizes, among them the highly regarded Premio Strega. Translated into French in 1982, it became a best seller in France, winning the Prix Medicis. The Name of the Rose was translated into English in 1983, and in the United States, the hardcover edition remained on the best-seller list for forty weeks, ultimately selling more than one million copies. The paperback rights brought $550,000, reputed to be the largest sum of money ever paid for a paperback translation, and sales of the paperback edition exceeded eight hundred thousand copies within the first three months after its appearance. The Name of the Rose has been translated into more than thirty-six languages, including Japanese, Chinese, Korean, Vietnamese, Turkish, and Arabic. A motion picture version directed by Jean-Jacques Annaud was released in 1986. Within a few years after the publication of his first novel, Umberto Eco had become one of the most well-known writers in the world. Success as a Catalyst to Creative Output. Maintaining the momentum he gathered during his success in the 1980s, Eco has continued to publish novels, philosophical texts, and children’s books, in addition to his scholarly publications. His recent literary works include The Island of the Day Before (1995), Baudolino (2001), and The Mysterious Flame of Queen Loana (2005), and On Ugliness (2007). Success as a Catalyst to Scholarship. The success of his novels and the steady progress of his scholarly work brought Eco the highest academic and public distinctions. All the while, Eco remained fully involved in the academic pursuits to which he was devoted before he became famous. His scholarly and theoretical writing continues unabated, as does his commitment to the progress of semiotics. He remains the editor of Versus and continues to serve on the editorial boards of other journals. At the same time, the enormous success of his novels has greatly intensified academic interest in his work. His fame as a novelist has led to an exponential increase in invitations to lecture and teach at institutions all over the world. He currently holds over thirty honorary doctorate degrees from prestigious universities around the world. Italo Calvino (1923-1985): Nobel Prize-winning Italian writer and folklorist, Calvino is the most translated Italian writer of the twentieth century. His early work has been classified as magic realism; his later work is perhaps better described as postmodern. Claude Levi-Strauss (1908—): French anthropologist, his theory of structuralism is an attempt to describe and understand human society. Levi-Strauss's thoughts have been widely adopted by both philosophers and postmodern authors. Ian Fleming (1908-1964): Author of the James Bond canon of spy novels, as well as the children's book Chitty Chitty Bang Bang, Fleming was himself an intelligence operative during the Second World War. Jorge Luis Borges (1899-1986): Perhaps the best known of the Latin American "boom" authors of the midtwentieth century, Borges was a fiction writer, thinker, historian, anthropologist, and critic. Alcide De Gasperi (1881-1954): Italian politician recognized today as one of the founding fathers of the European Union. The Book of the SubGenius (1983), a book by J. R. ''Bob'' Dobbs. This work is a compilation of bizarre, humorous, and sometimes disturbing ramblings of the Church of the SubGenius, a surrealist collective, which takes on conspiracy theories, New Age gurus, American arcana, and other sacred cows. The Illuminatus! Trilogy (1975), novels by Robert Shea and Robert Anton Wilson. This postmodern trilogy of novels simultaneously satirizes and celebrates the topsy-turvy world of modern conspiracy theories. Many of the trilogy's ideas have since become canonical among conspiracy theorists, an idea Eco would revisit in Foucault's Pendulum. The Da Vinci Code (2003), a novel by Dan Brown. One of the best-selling books of all time, Brown's conspiracy- detective novel covers similar ground to Foucault's Pendulum. As a semiotician, novelist, medieval scholar, journalist, and parodist, Eco has produced an amazingly diverse and influential body of work since the 1950s, and he is certainly one of the most prominent public intellectuals in the world. Authors of notable influence on Eco include James Joyce, Jorge Luis Borges, Charles Pierce, Immanuel Kant, and Aristotle. Factual Fiction. One trait found throughout Eco’s fictional works is an abundance of factual information related to the many fields that interest the author, from history to architecture to language. In his 1990 article ‘‘Pendulum Diary,’’ William Weaver, who had translated all three of Eco’s novels into English, remarks on the tremendous amount of ‘‘sheer information’’ that Eco puts into his fiction, noting that Foucault’s Pendulum, like its predecessor, is marked by elaborate and abstruse references, extravagant linguistic play, and a formidable number of quotations. The Battle Between Tradition and Modernism. Set in a Benedictine abbey in northern Italy in the year 1327, Eco’s first novel, The Name of the Rose, is both an elaborately detailed medieval detective drama and a semiotic novel of ideas. When several monks are murdered in a sequence echoing the biblical prophecies of the Apocalypse, Brother William of Baskerville is summoned to apply his enlightened deductive powers to solve the mystery. From this central scenario, Eco creates a conflict between the modern values of rationality and humor, represented by William, and the superstition and severity of the Middle Ages, as embodied by Jorge de Burgos, the blind and aged guardian of the abbey’s labyrinthine library. A maze of literal and metaphoric possibilities and obstacles, the library conceals the key to the mystery—a collection of heretical texts considered so incendiary that their discovery prompts several murders. William’s search for truth is confounded by stubborn authorities, including officials of the Inquisition, and this conflict reflects differences between modern humanism and absolute submission to the Church. Imagined Conspiracies. While The Name of the Rose moves forward from the Middle Ages to the intellectual issues of the twentieth century, Foucault’s Pendulum moves backward, confronting the reader with an avalanche of arcane learning about such subjects as the Knights Templar, the Cabala, and the Rosicrucians. In Foucault’s Pendulum, Eco extends the scope of his metaphysical study to include many of the historical and religious mysteries of the last two millennia. Although the novel revolves around a seedy publishing house in contemporary Milan, it examines mystical phenomena from Stonehenge to the Crusaders’ Jerusalem to exotic rituals in modern Brazil. Three editors involved in publishing texts dealing with occultism and esoteric practices are supplied a manuscript by a man they believe is a charlatan. With the aid of a computer and some quixotic analogies, they create a six-hundred-year web of arcane correlations linking the Templars’ secret to the motives of such historical figures as the Benedictines, Karl Marx, Sigmund Freud, and Adolf Hitler. As they reinterpret most of human history to fit their theoretical matrix, the three editors begin to believe their own fabrication and, as ardent occultists learn of the secret, this eventually results in murder and human sacrifice. While the novel follows the myriad twists of the editors’ inner trains of thought, it finally condemns their illogical folly. In the years since his success in the 1980s there has been an explosion in the number of doctoral dissertations written on Eco’s work, with the novels being their principal concern. While his influence on the most recent generation of intellectuals, philosophers, and artists remains to be seen in full, there can be little doubt that he occupies a central place in the geography of contemporary Italian letters. The success of his novels and the steady progress of his scholarly work throughout the 1980s brought Eco the highest academic and public distinctions. In 1983 the Rotary Club of Florence honored him with its Columbus Award, and in 1985 he was made a commander of France’s Ordre des Arts et des Lettres. In the same year he also received the Marshall McLuhan Award from UNESCO Canada and Teleglobe. Since 1985 universities throughout the world have awarded him twenty- four honorary degrees. Critics, however, have offered varying responses to two of his major works. The Name of the Rose. Critics lauded Eco’s ingenious plot and challenging intellectual discourse. Franco Ferrucci observed: ‘‘The narrative impulse that commands the story is irresistible. That is no mean feat for a book in which many pages describe ecclesiastical councils or theological debates.... Yet Mr. Eco’s delight in his narrative does not fail to touch the reader.’’ Despite its occasionally cerebral tone and frequent Latin quotations, The Name of the Rose achieved widespread international popularity and was adapted for film in 1983. 1. Identify the most striking conventions of the detective story. What do readers expect to find when they read a mystery? How does Eco meet or subvert these expectations in The Name of the Rose? 2. Construct a time line of the major historical events in Western Europe in the fourteenth century. How do these events play a role in The Name of the Rose? How does having knowledge of medieval history affect your reading of The Name of the Rose? 3. Foucault’s Pendulum features an invented conspiracy that turns out to be real. As an exercise, invent a conspiracy of your own; choose a selection of individuals and organizations that do not seem to be connected to each other to act as puppets of your conspiracy. What goal does your conspiracy work toward? How does it use its puppets to further its aims? 4. Compare the film version of The Name of the Rose to the book. Do Eco’s themes come across in the movie? What elements of the book are minimized or left out of the film? Bondanella, Peter E. Umberto Eco and the Open Text: Semiotics, Fiction, Popular Culture. Cambridge, U.K.: Cambridge University Press, 1997. Capozzi, Rocco, ed. Reading Eco: An Anthology. Bloomington: Indiana University Press, 1997. Inge, Thomas M., ed. Naming the Rose: Essays on Eco’s ‘‘The Name of the Rose.’’ Jackson: University Press of Mississippi, 1988. ‘‘The Name of the Rose.’’ Novels for Students. Vol. 22. Eds. Ira Mark Milne and Sara Constantakis. Detroit: Gale, 2006. Tanner, William E., Anne Gervasi, and Kay Mizell, eds. Out of Chaos: Semiotics; A Festschrift in Honor of Umberto Eco. Arlington, Tex: Liberal Arts Press, 1991.